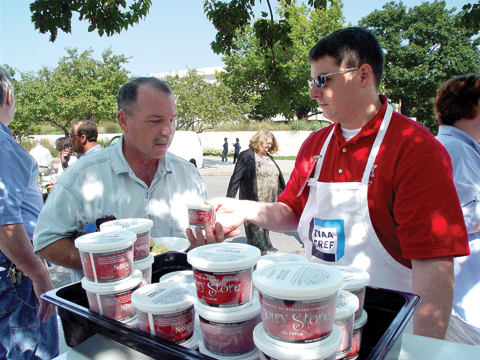 SINGLE SERVICE - Ethan Rowley of University Housing (right) hands out the Dairy Store's new single-serve ice cream packages during the all-university picnic on Sept. 7. The packaging is part of a larger makeover for the Dairy Store, which will celebrate a 90th anniversary in June. Photo by Troy Fedderson/University Communications. A campus landmark is undergoing a sweet makeover. Plans will move forward to incorporate a student-approved multicultural center into the Nebraska Union. General education reform is transitioning from committee to UNL's eight colleges. Human rights and political expert Azar Nafisi will present the 11th annual Governor's Lecture in Humanities when she delivers the next lecture in the E.N. Thompson Forum on World Issues, 7:30 p.m. Sept. 20 at the Lied Center for Performing Arts. Reported enrollment at UNL increased 431 total students for the fall semester 2006 as of Aug. 31 - an increase of 2 percent over a year ago. The Office of the Senior Vice Chancellor for Academic Affairs has announced year three of the Initiative for Teaching and Learning Excellence. Cockroaches are warming up. Bees are buzzing. Chocolate chip chirpies are ready to munch. And, when the gates to the Lincoln Children's Zoo open Sept. 16, hundreds of emerging entomologists (and more than a few uneasy parents) will explore the world of insects at the 10th annual Bug Bash. With the exhibition "Anxious Objects: Willie Cole's Favorite Brands," New Jersey artist Willie Cole brings an interpretation of urban American culture and a revealing glimpse into his identity to the Sheldon Memorial Art Gallery this fall. Films about a teenager facing womanhood and the life of a noted architect open Sept. 15 at the Mary Riepma Ross Media Arts Center. A special screening from the International Experimental Cinema Exposition opens at 7 p.m. Sept. 21 at the Mary Riepma Ross Media Arts Center. Sir James Galway, known as "the man with the golden flute," will perform at 7:30 p.m. Sept. 21 at the Lied Center for Performing Arts. Emmy and Grammy Award-nominated comedian George Carlin will bring humor to the main stage at the Lied Center for Performing Arts at 7:30 p.m. Sept. 22. The opening act will be singer/songwriter Vance Gilbert. University of Nebraska Press is offering four new books published by UNL faculty or alumni in September. Terese Svoboda will read from her novel, "Tin God," at 7 p.m. Sept. 14 in the Dudley Bailey Library, 228 Andrews Hall. In September NET Radio's "Nebraska Concerts" series offers classical music from the Omaha Symphony and the Calder Quartet, as well as a concert from this summer's Jazz in June series. The weekly NET Radio series of fine classical and jazz music airs Sundays at 2 p.m. In many American poems, the poet makes a personal appearance and offers us a revealing monologue from center stage, but there are lots of fine poems in which the poet, a stranger in a strange place, observes the lives of others from a distance and imagines her way into them. This poem by Lita Hooper is a good example of this kind of writing.